Mary Lou Bruner, extremist who thinks Obama was a prostitute, heads to runoff in Texas State Board of Education race. An Extremist Running for Texas’ Board of Education Won Big on Super Tuesday. That’s Not Just Texas’ Problem. 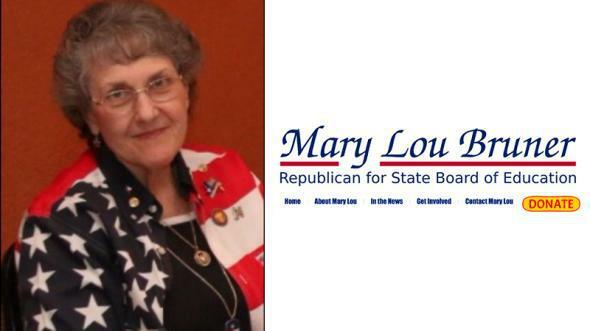 Texas State Board of Education candidate Mary Lou Bruner loves America. Do you want a person who believes that the current occupant of the Oval Office was once a prostitute to decide what’s in your children’s textbooks? How about a woman who thinks that climate change is a Marxist “HOAX” (caps hers) to steer K–12 curricula for more than 5 million kids? Well, then Texas has a candidate for you—and she won big on Super Tuesday. It seems the Lord has been listening to Bruner, for she took a commanding 48.45 percent of the vote in a three-way race for the Republican nomination for one of the state board’s 15 seats. She will face a run-off—in Texas, you have to hit the 50 percent threshold to make it official—against the second-place candidate in what promises to be a very-tiny-turnout election in late May. Because Texas heavily influences textbook content for schools all over the country, Bruner’s probable ascent is a very big—and very disturbing—deal. Her other views are just as, uh, imaginative. She believes that school shootings started “after the government removed the Ten Commandments and the Bible from public school buildings, and disallowed prayer at school and school events,” that “Evolution is a religious philosophy with propaganda supporting the religion of Atheism,” and that all “terrorist-mass murderers” are self-described Democrats or liberals (“Is there a pattern developing here?”). To the television reporter who asked me while the camera was rolling if I REALLY believe there was a man named Noah who built an Ark and filled it with pairs of animals, and the entire world was covered with water: THE ANSWER IS STILL “YES, I believe the Holy Bible. I believe there was a Great Flood. How do YOU explain fossils of seashells and other sea animals on tops of mountains all over the world? How do you explain the Grand Canyon? You are very naive if you believe a tiny river carved out the Grand Canyon. I believe it took a lot more water than that to carve out the Grand Canyon and other land and rock formations formed by water erosion. You can call me ignorant or intolerant or whatever you want, but I did not make fun of YOUR religion. Islam is not a religion. Islam is an inhumane totalitarian political ideology with radical religious rules and laws and barbaric punishments for breaking the religious rules. If Islam is a religion it is a cult religion .…The USA should ban Islam and stop all immigration. from Muslim countries because Islam’s stated goal is to conquer the USA and kill the infidels (nonbelievers). I stand for truth in education not political correctness. I believe schools should teach the knowledge and skills that made the USA the leader of the world. I believe the children belong to the parents not the federal government. I am very concerned that our students are not getting an education that will prepare them to be independent minded, productive citizens. Liberals want to eliminate time-proven methods such as phonics, grammar and spelling rules, and cursive handwriting. Some of them want to eliminate the memorization of the times tables except for the 2’s, 5’s, and 10’s. I’m totally with her on the need for a cursive comeback, but as for the rest of it—do we laugh, or cry? We could dismiss Bruner’s obviously gonzo worldview if she really were some random fringe candidate printing out pamphlets in her lonely home office. But after Tuesday night, she’s become a serious power player. That’s because members of the Texas State Board of Education wield a huge influence not just in Texas but all over the country, simply as a result of the massive size of Texas’ textbook market. Learning materials developed for Texas’ 5 million students are often used in other states as well, which is why the ongoing kerfuffle over historical, um, flourishes in the books—describing slaves as “workers from Africa,” say, or referring to the slave trade as the “Atlantic triangular trade,” or recasting the causes of the Civil War—remains such a big news story. When, as seems likely after Tuesday’s results, Bruner takes a seat on the board, replacing the moderate Thomas Ratliff, who decided not to pursue re-election, we can expect even more insanity in years to come.